Caring for the people we serve is rewarding and meaningful work. Aging well and quality of life issues are at the core of our work. Providing activity programs specifically designed for each person we serve fills a universal need for empowerment. It is an invaluable, hands-on resource with practical, down-to-earth information on the latest changes to federal regulations, including the new F-Tags and the emphasis on the culture change movement. As the positions described in this book continue to increase in responsibilities and importance, we will continue to provide the resources you need to work as a professional and provide quality care. Elizabeth (Betsy) Best-Martini is a Recreational Therapist specializing in the field of gerontology. She has a Master of Science degree in Recreation Therapy / Administration. She is also a certified Caner Exercise Specialist. Her consulting firm, Recreation Consultation & Fit For Life has provided recreational therapy consultation to over 200 retirement communities, skilled nursing settings, sub-acute settings, and residential/assisted care facilities in Northern California. Betsy has trained over 800 qualified activity professionals in Northern California. In addition she provides one-to-one recreational therapy to clients needing assistance and assessment in the areas of physical activity. Betsy is a well-known presenter at national and state conferences for activity professionals and recreational therapists. She has been an academy faculty member of the American Therapeutic Recreation Association. 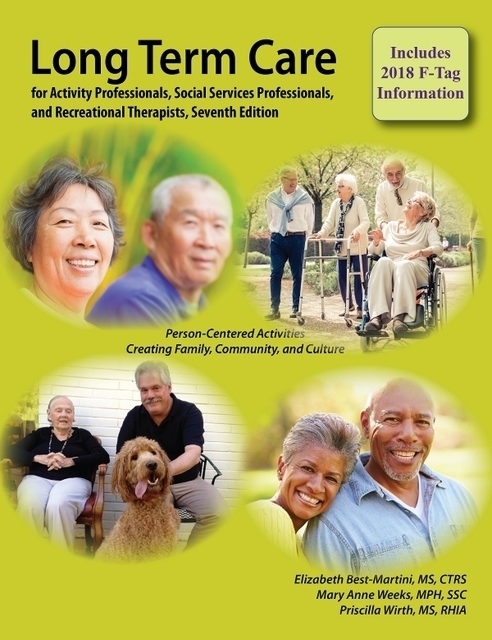 Her three publications are being used nationally and throughout Canada as training manuals for Activity Professionals and Recreational Therapists: Long-Term Care 7th Edition, Exercise for Frail Elders, and Quality Assurance for Activity Programs. Betsy is a certified fitness instructor through the Senior Fitness Association. She writes a fitness column called "Let's Get Moving" for Creative Forecasting. She teaches two strength-training classes with older adults weekly in addition to teaching a certification class for students interested in becoming fitness instructors with frail elders and adults with special needs. She also provides training in Exercise for Frail Elders and Adults with Special Needs. When enjoying her own leisure, she can be found gardening, hiking, exercising, and spending time with her husband, family, and many pets. Mary Anne Weeks has worked as a Social Worker (SSC) in nursing facilities since November of 1982. At that time, few facilities in California had yet realized a need for such a discipline so there were no "rules." Fortunately, Mary Anne had long ago, in 1965, worked as a summer intern in a prototype retirement home in Rochester, New York. Her past experience in this setting with various levels of care made the environment in nursing settings more familiar to her. In the meantime, she had also received an undergraduate degree from the State University of New York, Genesee and pursued graduate work at University of California, Berkeley where she completed her Master Degree in Public Health. Mary Anne lives in Sonoma, California, with her husband and two children. She is a Social Service Consultant in the specialty area of social services and is a lecturer at the community college level. Priscilla Wirth is a Health Information Consultant for long-term care facilities. She is a Registered Health Information Administrator, receiving her degree from Seattle University. She has been in the health information profession since 1980. Her Bachelor of Science degree and Master of Library Sciences were received from Northern Illinois University. Priscilla is currently practicing in Sonoma County, California, and is a member of the American Medical Record Association, the California Health Information Association, and the Network of Health Record Consultants. She is a lecturer at the community college level.